Pseudoephedrine is an over-the-counter (OTC) medication in the U.S. It is typically used to treat nasal congestion, sinus congestion, and a runny nose. These symptoms may be caused by multiple conditions such as the common cold, sinusitis or allergies. Pseudoephedrine only treats symptoms; it is not a cure for viral or bacterial illness. Some doctors have prescribed pseudoephedrine to treat fluid in the ear, but the effectiveness of this has been shown to be poor. Common Brand Names: Sudafed, Decofed, Drixoral, and Suphedrin. You should know that Sudafed PE is actually made with phenylephrine, which is similar to, but not the same as pseudoephedrine. You have a runny nose, nasal congestion, sinus congestion, or severe symptoms related to allergies. You are healthy and have never had an allergic reaction to pseudoephedrine or another medication that contains pseudoephedrine. If you have health problems, take other medications on a regular basis, or if you are are pregnant, you should check with your doctor and pharmacist before taking pseudoephedrine. You have had an allergic reaction to it in the past. You are taking any medications in a class called MAO inhibitors, such as: isocarboxazid (Marplan), phenelzine (Nardil), selegiline (Eldepryl, Emsam, Zelapar), and tranylcypromine (Parnate). If you have been off one of the previously listed or other MAO inhibitors for more than 14 days, it is safe to take pseudoephedrine. This medication should be used cautiously in people who have a history of: high blood pressure, thyroid disease, heart disease, an enlarged prostate gland, or diabetes. Newborns should not be given pseudoephedrine, nor should women who are breastfeeding. Notify your doctor and pharmacist if you have any of these conditions. Pseudoephedrine comes in different forms, including tablets, extended-release tablets, and liquid. It is available over-the-counter in both children and adult formulas, so make sure that the formula you buy is age-appropriate. Extended-release tablets should never be cut, crushed or chewed. Because pseudoephedrine can cause you to become nervous or excited, it is best taken in the morning or afternoon so it doesn't interfere with sleep. Follow the directions on the bottle carefully before giving or taking pseudoephedrine, and contact your doctor or pharmacist with any questions. Pseudoephedrine is considered an alpha & beta-agonist as well as a decongestant. The alpha and beta refers to the types of receptors within your body that the medication stimulates. 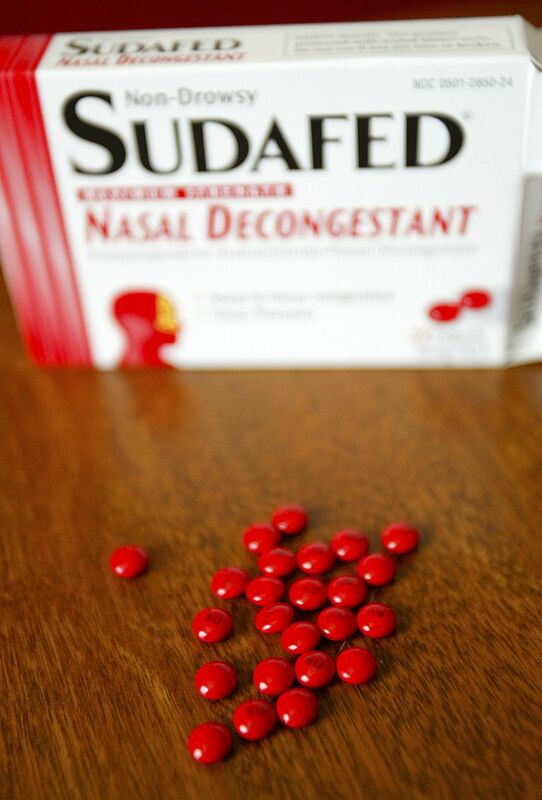 Pseudoephedrine causes your blood vessels tighten (or constrict) which helps to relieve nasal and sinus congestion. However the alpha and beta receptors once activated also stimulates your heart rate, slows down some portions of your digestive system, while stimulating other portions, which leads to some of the side-effects described below. These symptoms should go away when you are done using this medication. If these symptoms are severe or if they last a long time, you should call your doctor. You should also call your doctor if you experience: nervousness; dizziness; fast, pounding or irregular heartbeat; stomach pain or difficulty breathing. Why Do I Have to Ask the Pharmacist for Pseudoephedrine? On March 9, 2006, President George W. Bush signed the Combat Methamphetamine Epidemic Act of 2005, which was incorporated into the Patriot Act. Methamphetamines are highly addictive drugs that are "cooked" in illegal labs throughout the United States. These manufactured methamphetamines can then be swallowed, inhaled, injected, or smoked to get the stimulant effect. You are not required to have a prescription for pseudophed, however the act required that the over-the-counter purchase of pseudophed, ephedrine, and phenylpropanolamine be changed to a behind-the-counter approach. This requires you to present your driver's license for tracking purposes. You however should not worry about providing this information unless you are buying mass quantities of pseudophed, as it takes 700 to 1000 pills to make a batch of methamphetamine product.